Portfolio show's are one of the most important days for a student attending design school. It's their final step before graduating and one of their first opportunities to network and meet potential employers. We love being a part of this special day by creating custom portfolios that represent our customer's sense of style and individuality. We're intrigued by each student's unique and creative portfolio design and how they decorate their tables to match their personality and branding. For anyone whose big day is approaching, we've gathered four inspiring portfolio tables that our customers laid out at their shows. These tables are all one of a kind and definite show stoppers! 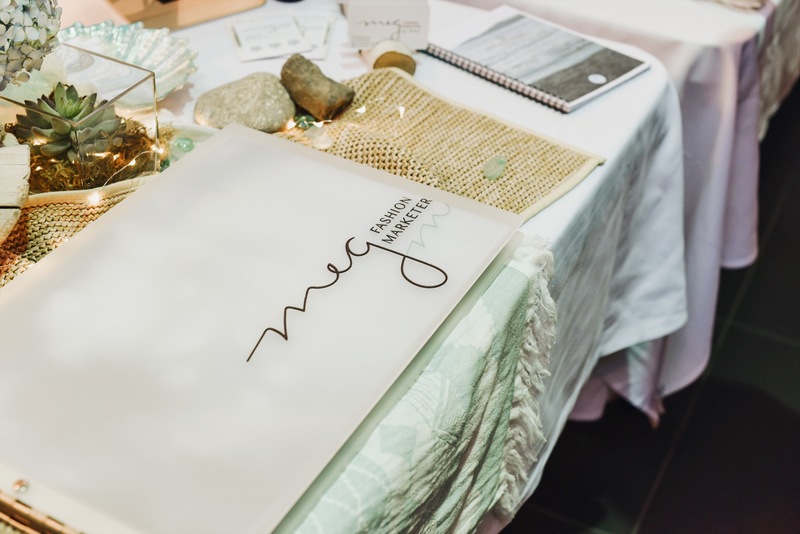 Megan's frosted clear acrylic portfolio book with an engraved color fill is displayed beautifully on a table decorated with elements reminiscent of a relaxing beach day. She brought the beach to her table through elements like shells, sea glass and a small log. We love how she livened up the table with flowers and succulents. The flowers even matched her warm pastel color scheme! To stand out from her classmates, she included both a blue and woven beige table cloth that tied into her beach theme. Megan displayed her business cards on a small wooden branch with slits for the cards. We love to see students with unique ways of showing off their business cards based on their chosen theme. 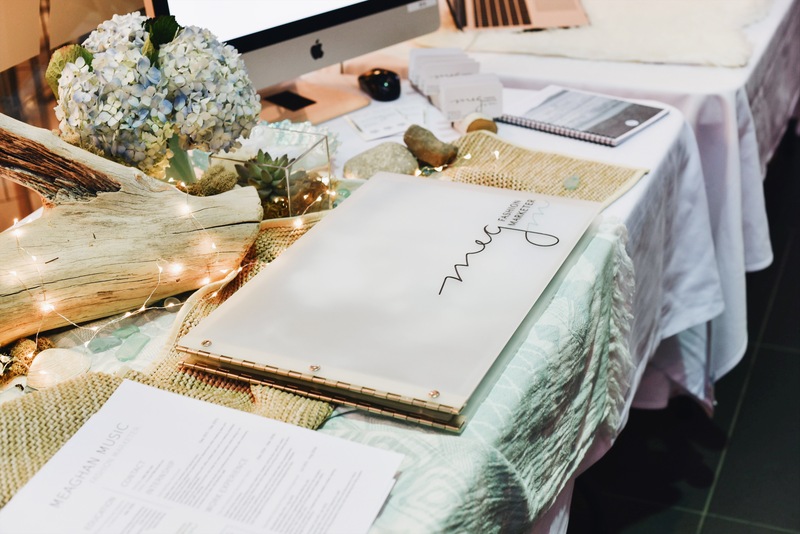 Megan's table shows how tactile and tangible elements can draw attention to your area at the show and attract potential employers right away. 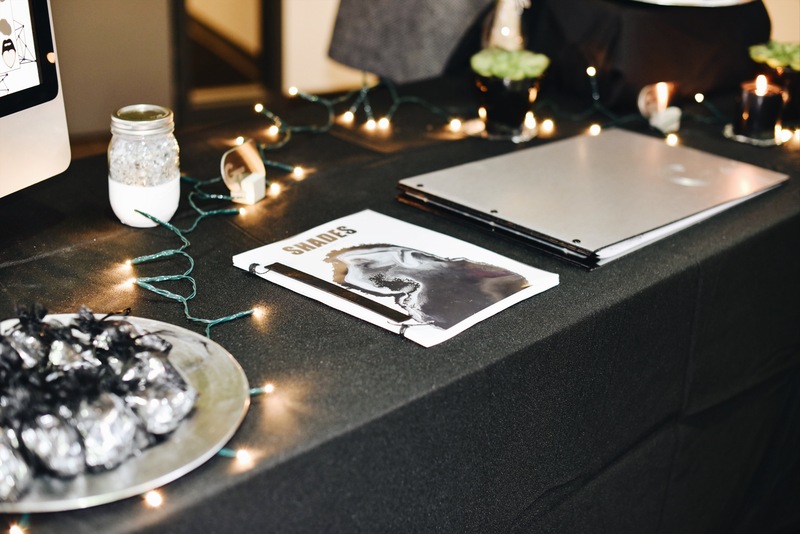 Shay's table features our matte black acrylic portfolio book with an engraved color fill of metallic silver. 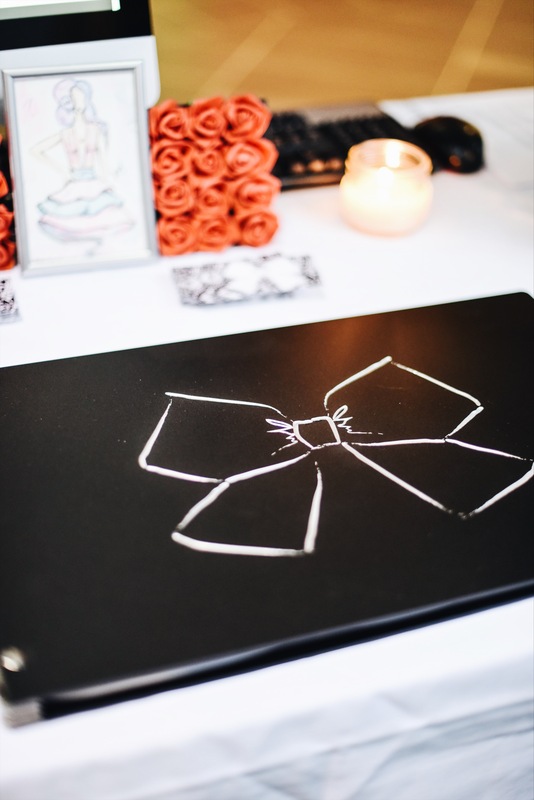 Her delicate bow illustration on her portfolio perfectly reflects the exquisite table design she decided to go with. 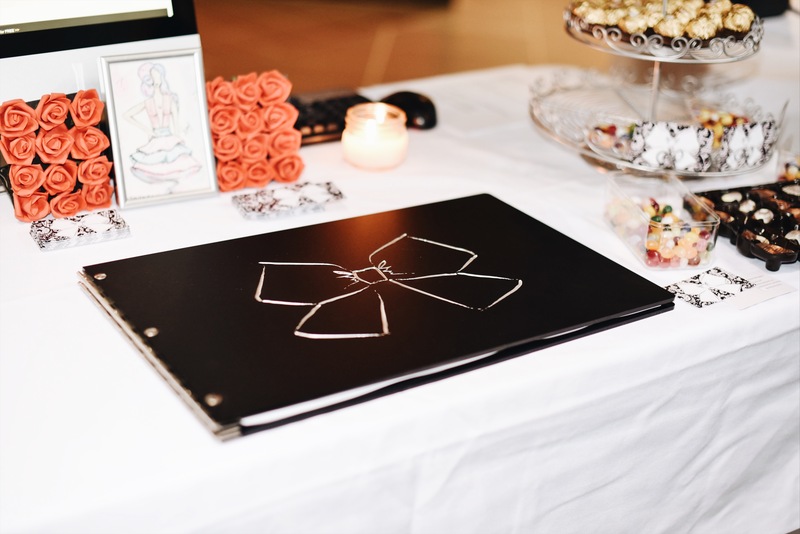 Shay's elegant and minimalist branding is easily captured through her portfolio show table layout. We love the way one of her fashion illustrations were displayed between to sets of roses. A great way to show off your work, apart from in your portfolio book, is to have your favorite piece displayed separately so it will be seen right away. This will catch a potential employer's attention and lead them to ask more questions about the art. Another takeaway from Shay's portfolio table is the addition of food to your table! Who doesn't love a tasty treat? People will automatically be drawn to your table if you're offering a free snack and they''re more likely to stick around to chat while they eat. Bailey's custom amber bamboo portfolio book with an engraved color fill reflects her eco-friendly aesthetic that reveals itself in her work and design philosophy. Her table is another example of how plants such as succulents add color and liveliness. 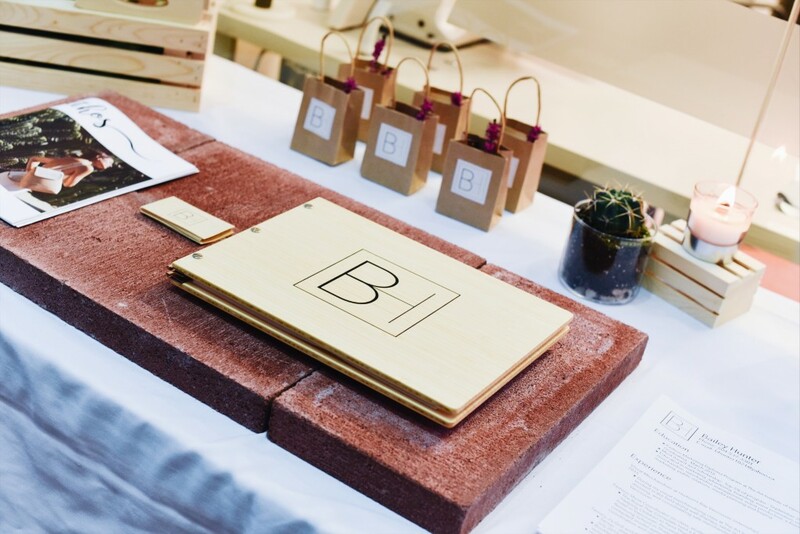 Bailey displayed her portfolio book and business cards on foam made to resemble brick. 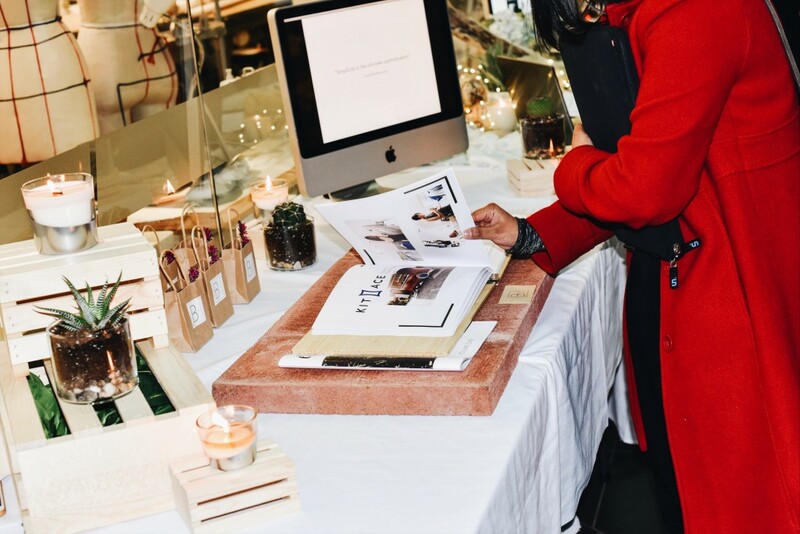 Her custom portfolio stood out from the rest of the table since it was heightened like a pedestal for her work. She used bamboo crates matching her portfolio book to hold succulents, adding varying heights to her table. What stood out the most to us about Bailey's table was her little goody bags. It's a clever idea to have a small take-away that features your branding and logo so people will remember you once they've left the show. Plus, people are always stoked on receiving free goodies! 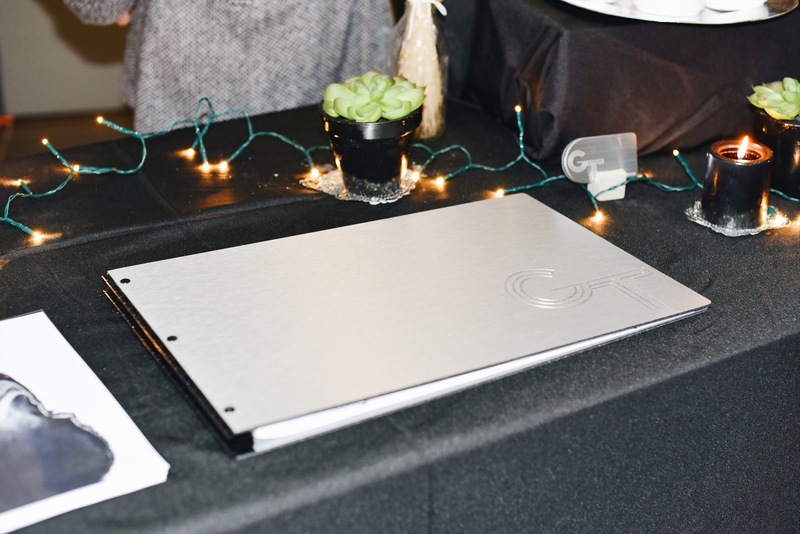 Gurleen's custom brushed silver aluminum portfolio book with a burnishing treatment is displayed beautifully on her show table featuring a black table cloth. The use of the table cloth allows her to stand out from the rest of the white table cloths. We recommend switching it up and adding your own table cloth to your portfolio show table to emphasize your color scheme further. Gurleen also used succulents as a tactile element on her table. A splash of green s an awesome contrast against the black table cloth. It's important to add contrast to your table to draw employer's attention and catch their eye so they'll visit your table. Gurleen highlighted her silver theme through silver doilies under her succulents and a silver plate holding her giveaways. We love the way she wrapped lights around the top of the table, adding vibrancy against a darker theme. She also lit up her table with a couple candles to create a warm and inviting display. Based on these 4 examples we have summed it up into 5 hot tips for your upcoming portfolio show table design. 1. Be unique by adding a table cloth that matches your brand color scheme. 2. Feature your favorite project or artwork separately from your portfolio to strike up conversation right away. 3. Prepare some goody bags for people to take home that feature your logo and branding. 4. Add varying heights to your table to draw people's attention from far away. 5. Display your business cards on or in a tactile item that reflects your branding theme. We look forward to seeing all the beautiful tables out there this portfolio show season! New! Full Color UV Print Treatment for your Custom Portfolio Book!